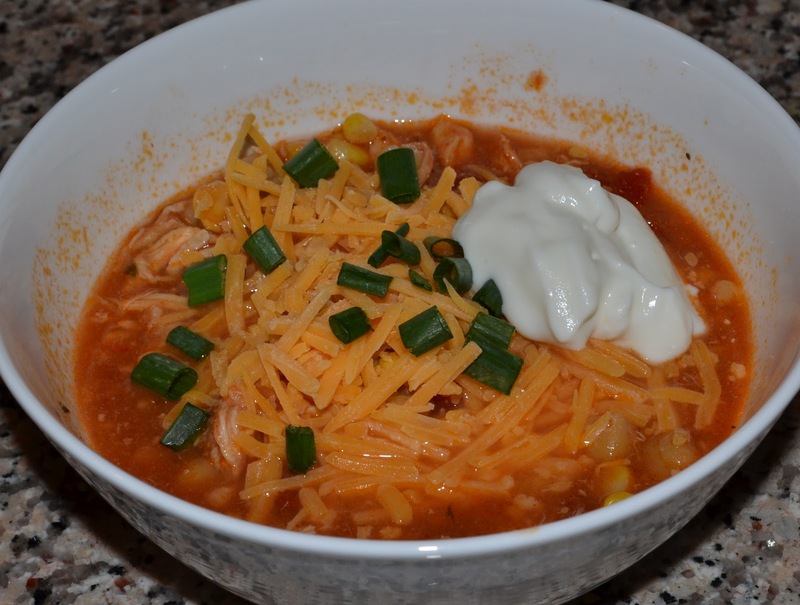 We made a crock pot recipe from one of my favorite healthy recipe sites, Skinny Taste. We made just a minor adjustment and the Chicken Enchilada Soup was wonderful! Heat olive oil in a saucepan over medium-low heat. Add onion and garlic and saute until soft, 3-4 minutes. Slowly add the chicken broth, tomato sauce and chipotle adobo sauce and bring to a boil. Add cilantro and remove from heat. Pour into crock pot. In crockpot, add drained beans, diced tomatoes, corn, cumin, oregano and stir. Add the chicken breasts; cover and cook on low heat for 4-6 hours. Remove chicken and shred with two forks. Add chicken back into the soup, adjust salt and cumin to taste. Serve in bowls and top with sour cream, cheese, scallions and cilantro or whatever other toppings you wish! You know I love me some sour cream and cheese! This was delicious and has a little smokiness to it from the adobe chilies but not too spicy (of course you could add many more if you want it spicy). Try this one out before the really warm weather hits! Heathly and chicken enchiladas in one sentence!?!?! I'm pinning this for later :) It sounds delish!! !